Sometimes a full blown garden isn’t in the picture for you. You might not have the space or the time to devote to a big vegetable garden but you still like to cook with fresh ingredients. That’s when a small herb bed is perfect for you. When you go small, as in an herb bed, you find that you won’t need a ton of tools or supplies, just some basic utility items. Herb beds are the perfect way for a beginner gardener to ‘get their hands dirty’ and for those with minimal space. Besides a small plot, small bed or pots there are just a few things you need to get going. Yes, you could use your kitchen shears for pruning or harvesting herbs but you wouldn’t do that to your sewing shears so why do that to your kitchen shears? No, invest in a quality pair of pruning snips. Using the proper tools helps you by making the cutting easier and keeps a dull blade from damaging the plants. Whichever pruning shear (or snips) you get I’d suggest getting the best one you can afford. I recently ‘upgraded’ my shears from a ‘low end’ to a ‘highER end’ and was truly amazed at the difference in ease of cutting. I SO wished I’d bought better snips earlier in my gardening career. Did you realize that you can purchase kitchen scissors made for snipping herbs into pieces for kitchen use? These little scissors have multiple cutting blades making a quick job of dicing your fresh herbs. When planting your favorite herbs in pots it’s always suggested that you use a good potting mix. There are many different kinds available at your local hardware or home & garden store. You can find potting mix for specific types of plants as well as both organic and potting mix with nutrients incorporated into it’s making. Some folks like to let their herbs grow without doing anything extra, after all, they were considered weeds at one point. Some herbs do better in poor soil and some prefer a good organic mix. If you want you can top dress with compost. There are also many different fertilizers available and you can even find organic fertilizers such as those made from sea kelp and even from worm castings. It’s always best to put your herb bed where you have access to water. A nearby water hydrant is preferred. You can then use a water hose and a hose end sprayer to water, simulating rain. For those with no handy water faucet consider getting yourself an old fashioned watering can. It’s best to water in the morning. This gives nature time to soak up the moisture and helps avoid problems that overnight dampness can cause. 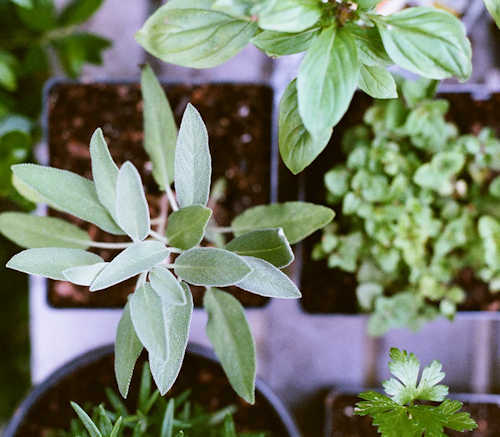 Aside from pots, potting trowel, some compost and fertilizer, pruning shears and a method of watering all you’re left with is choosing and planting your favorite herbs. Make this the year that you start and/or expand your herb beds.